You are here: Home Cat Home And Garden 4 Month Advantage Flea Control Purple: For cats over 9 lbs. 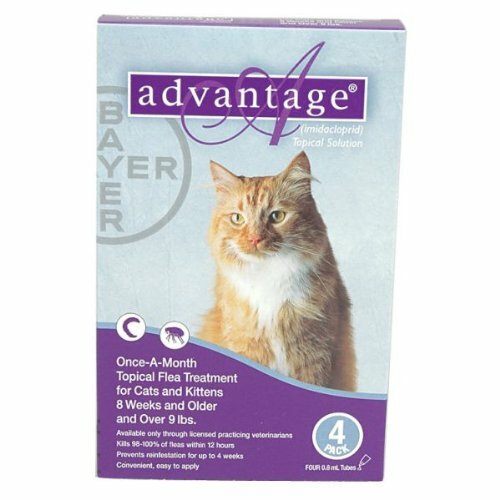 Advantage Purple kills fleas on cats fast. Advantage kills 98% of fleas within 12 hours and continues to work for up to one month per application. It also breaks the flea life cycle by killing flea larvae. Advantage can be used on kittens 8 weeks old. Also, it is safe for use on pregnant and nursing cats. Advantage is water-resistant, so it kills fleas even after shampooing and exposure to rain. Advantage is applied to the back of the neck on cats Effective Flea Control . . . No Prescription Required!Guaranteed US EPA approved. Contains imidacloprid, the fastest flea control, which kills adult fleas within 12 hours Each package of this long lasting topical lasts for 4 or 6 months Easy-squeeze tube makes application quick and easy.